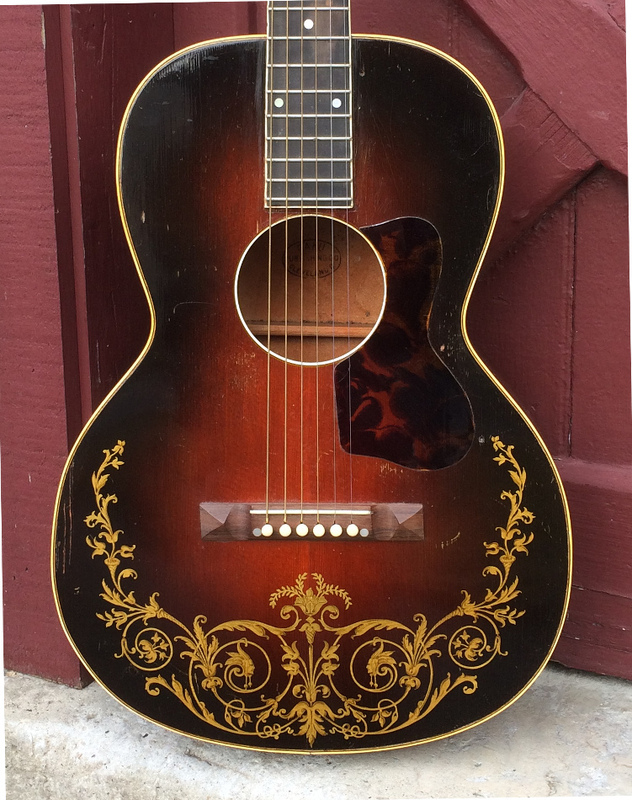 OAHU Jumbo c. 1935 | $1950 | An argument can be made that The OAHU Publishing Co., Cleveland, Ohio, facilitated more acoustic guitars to be bought pre-WWII than any other company, and the company didn't even build guitars! 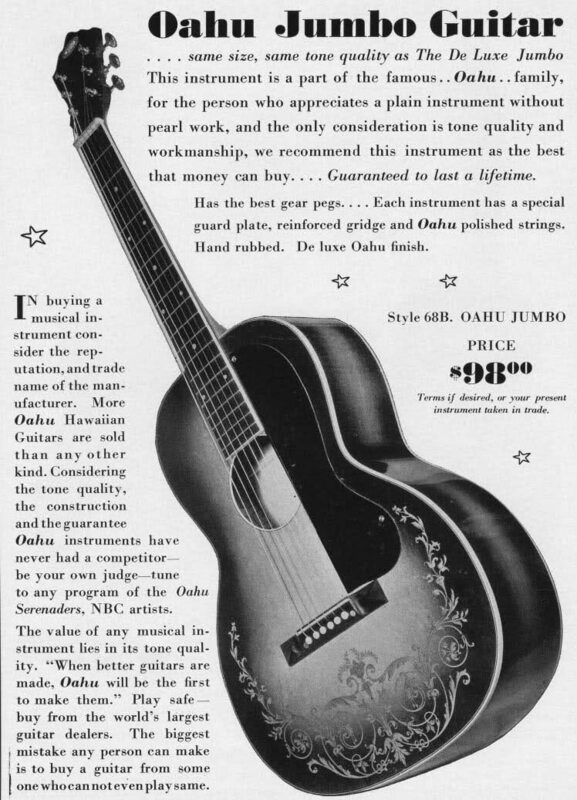 With its origins in Michigan, and later moving to Cleveland, OAHU Publishing was essentially a music publishing company, selling sheet music, guitars and accessories, with sales propelled by the immense popularity of Hawaiian music on the main land and prolific advertising. The bulk of OAHU guitars were contracted to the Kay company in Chicago, and the large majority of the those instruments were 'student' or 'catalog' grade instruments featuring birch bodies and painted binding or other low-level appointments. However, Oahu catalogs offered a number of quality, high-end flat tops through the thirties, with the 'jumbo' being the most sought by players today. The Oahu 'jumbo' evolved in essentially two phases, the first being 14 1/2" across at the lower bout, and the second, beginning in '36, measured 15 1/2" across the lower bout. This example is of the earlier type, 14 1/2" across at the lower bout, with a 4 1/2" body depth, and for this reason it is often referred to as the 'Nick Lucas', since it shares that coveted guitars dimensions. Scale length is 25 1/2". The neck shape is a very soft 'V', and measures 1 11/16" across at the nut, and 2 5/16" at the saddle. Both materials and construction are at a high level. The X-braced top is spruce with a reddish-mahogany sunburst, adorned with an intricate gold decal. The back and sides are a highly figured maple, likely ply, with both back and sides finished in a sunburst. Both top and back are bound. The neck is mahogany with what appears to be an ebony fingerboard, bound in white celluloid. The headstock sports the gold 'OAHU' decal. 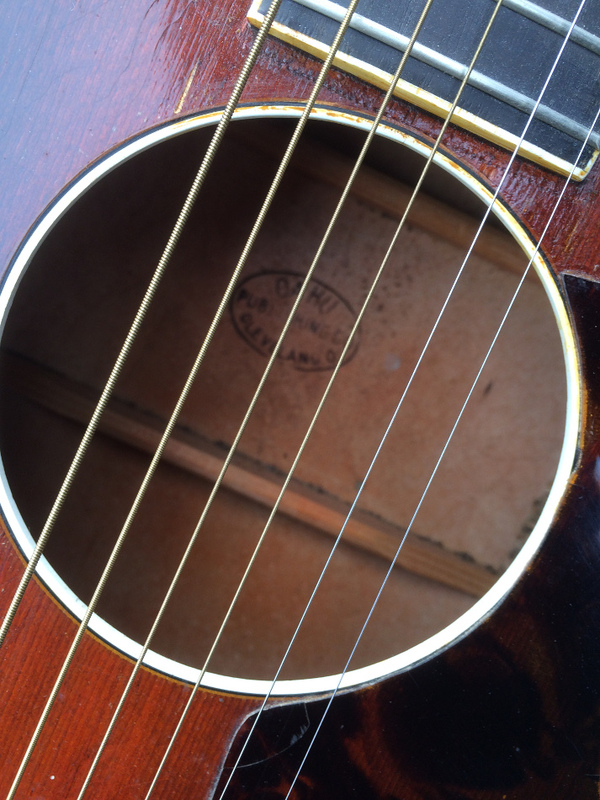 Tuners are the original Oahu patented 'Safe Ti-String Post' tuners, (note the slot across the top of the string post). The rosewood pyramid bridge appears original. This guitar began life as a square neck Hawaiian guitar, but was converted to Spanish a number of years ago. The profile is a very soft 'V', and the workmanship is quite good. It appears that a faux-tortoise pick guard was also added , which complements the top. Two small screw holes remain where the original pg attached. The frets appear to be later replacements, with no discernible wear. 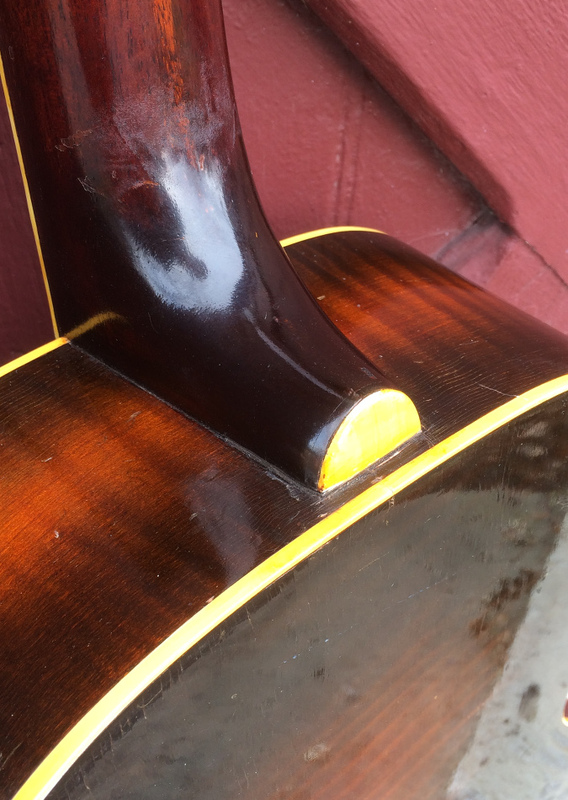 No other repairs or alterations are evident; the guitar is solid. With its large 'Nick Lucas' body, the guitar produces a powerful and rich sound. These are great fingerpicking guitars for ragtime and blues, and great value when compared to other 'golden era' flat tops.